We will proceed from north to south beginning with Key Biscayne, not chronologically. 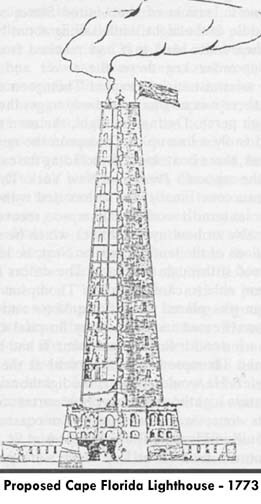 Most of these sites have a unique history of various visual beacons associated with its navigational aids. First a location chart. Fowey Rocks is off of Miami, Carysfort Reef off of North Key Largo, Alligator Reef off of Islamorada, Sombrero Key off of Marathon and American Shoal off of Sugarloaf Key. 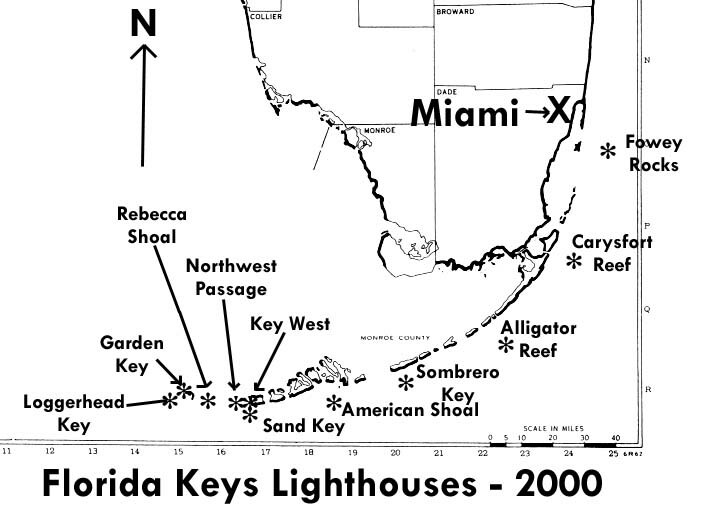 Sand Key is about 6 miles south of Key West and Northwest Passage about the same to the west. Rebecca Shoal is about half way between the Marquesas and the Dry Tortugas (Fort Jefferson). Loggerhead and Garden Keys are about 3 miles apart with Garden Key being at Fort Jefferson. 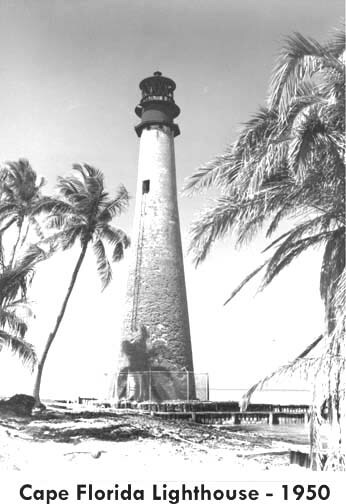 The idea of lighthouses in the Keys was not new with US ownership. 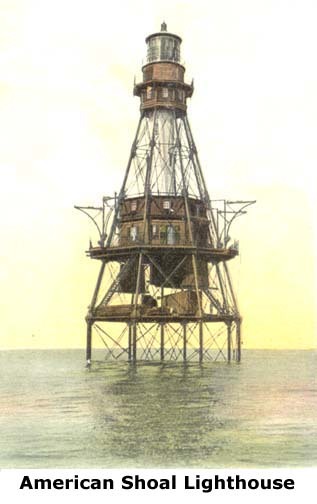 During the British ownership of Florida (1763 -1783), Gerard de Brahm proposed two wooden lighthouses at both ends of the Florida Reef. In passing, Florida's first light towers were in the St. Augustine area in the 1500s. A US owned lighthouse was lit at St. Augustine on April 5, 1824. A second Florida light was lit at Pensacola in December 1824, but these two were harbor lighthouses of less that 50 feet of height. 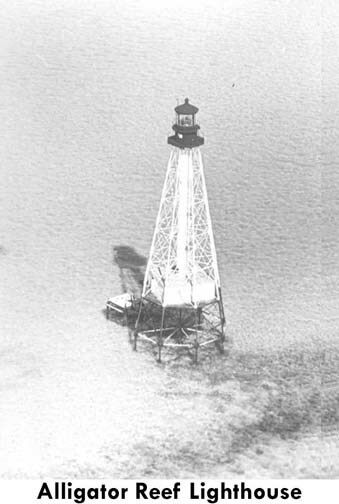 The Cape Florida Lighthouse was the first Florida ocean-coastal lighthouse. Its lantern was lit on December 17, 1825 although Keeper John Dubose forgot to tell the authorities. Officially, it was lit on March 10, 1826. The lighthouse was burned by Indians in July 1836, re-lit in October 1846 and decommissioned on June 15, 1878. It briefly operated again from 1978 to 1991. 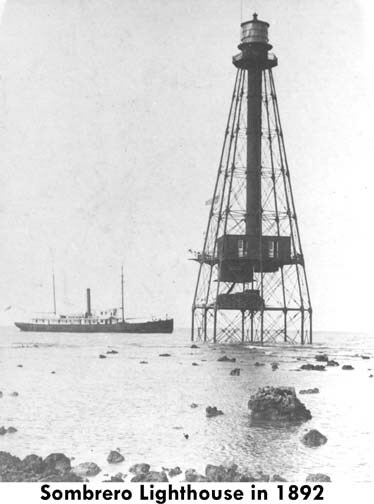 The Fowey Rocks Lighthouse replaced the Cape Florida Lighthouse and was lit on June 15, 1878. 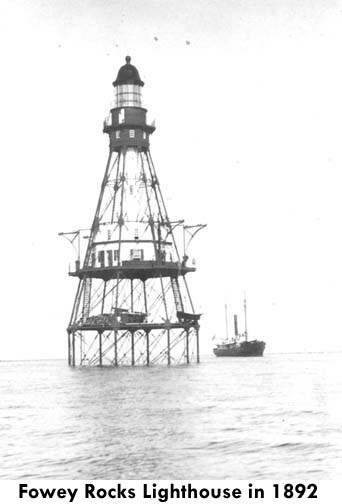 John W. Frow moved from the Cape Florida Lighthouse to become the Fowey Rocks' Keeper. It was automated in 1967. 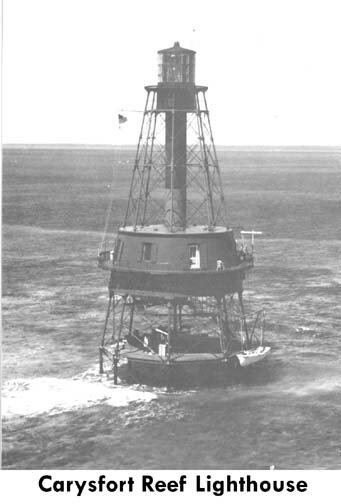 The 112-foot Carysfort lighthouse was lit March 10, 1852 and the lightship Florida was dismissed. A first-order Fresnel lens was installed in 1857. It was automated in 1960 and is presently solar powered. Lt. G. Gordon Meade [photo of a painting below] completed construction of Caryfort, Sombrero Key, Sand Key, and Rebecca Shoal lighthouses. 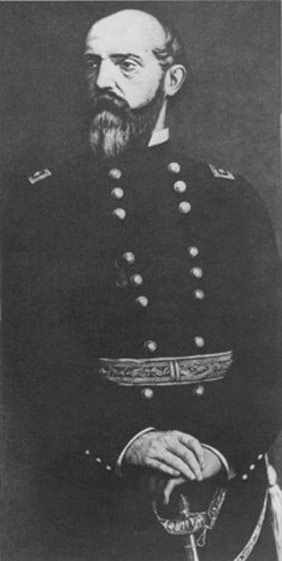 Lt. Meade later became Maj. Gen. Meade who defeated Gen. Robert E. Lee at the Battle of Gettsburg.